At this point, most people are well aware that the bees are in trouble. Last week, the U.S. Fish and Wildlife Service officially placed seven species of Hawaiian yellow-faced bees on the endangered species list. They believe their decline in population is the result of a long list of threats to the species, including predation, habitat loss, and human involvement. Bees are pollinators and crucial to our ecosystem; we depend on them for much of our produce. Around 30 percent of the world's crops rely on cross-pollination [PDF]. If you want to help the tiny buzzing insects from dying out completely, here are some small things you can do. Bees are steadily losing ground in our modern culture. Flowers and gardens are dwindling, meaning less and less food for the hungry bees. You can help protect the species right in your own backyard by starting a bee-centric garden. Plant flowering plants native to your area with a preference toward single flower tops like marigolds, tulips, and daisies. Double flower tops and hybridized plants don't yield the same level of nectar as single flowers tops, so it's harder for bees to reach the pollen. You should also try to have something flowering all year, so make a calendar for your garden that includes flowers in spring, summer, and fall. Once your bees have something to eat, you can build a potential home for the visitors. Leave a place in your garden open for bees to burrow, and add some branches or bamboo for wood-nesting bees. And always remember to only use natural pesticides and fertilizers that won't harm the bees who stop by. Controlling gardeners are going to have to loosen their iron grip for the sake of the bees; a healthy collection of dandelions and clovers can actually do a world of good. The leafy intruders—along with various wildflowers—offer substantial and much-needed nutrients. Dandelions in particular are extremely beneficial to bees, as well as other pollinators like butterflies, beetles, and hoverflies. Because these yellow weeds flower between March and May, they're ready to be pollinated just as the bugs are waking up from hibernation. Each flowering dandelion can have up to 100 florets, meaning plenty of food for your buzzing buddies. Laying off the pesticides will also keep the air poison-free and more accessible to bugs who would like to visit. Buying honey and other bee products from a local beekeeper is a great way to support local pollination. As long as the beekeeper knows what they're doing, they won't harm or disturb the bees in any meaningful way. Often bees make a surplus of honey, so they won't notice if we take some for ourselves. Beeswax is used to coat the honeycombs and is either sliced off by the beekeeper to get to the honey or burrowed through by the bees in the winter—either way it's discarded, so it would be a waste not to use it. It turns out bird baths aren't just great for birds. Bees need water just like all animals, so they seek out shallow puddles and bird baths to quench their thirst. You can get a bird bath or leave out a small saucer to help hydrate the bees in your neighborhood. Bees like to share information, so if you keep your water source consistent, the local pollinators will get wise and come visit. Just make sure to include a small rock or other object for them to perch on while they drink—bees are unfortunately not equipped with tiny floaties. There are plenty of products on the market that will help you help bees. If planting a full garden is too much work, you can opt for seed bombs. The little clusters of seeds can be tossed in areas like your backyard or an empty lot where they'll eventually turn into a colorful patch of wildflowers. You can also try seed money or pencils that can be planted in the ground to grow flowering and edible plants. Another option is to look into getting a Flow Hive. After an extremely successful Indiegogo campaign, the simplified beehive is available for purchase. 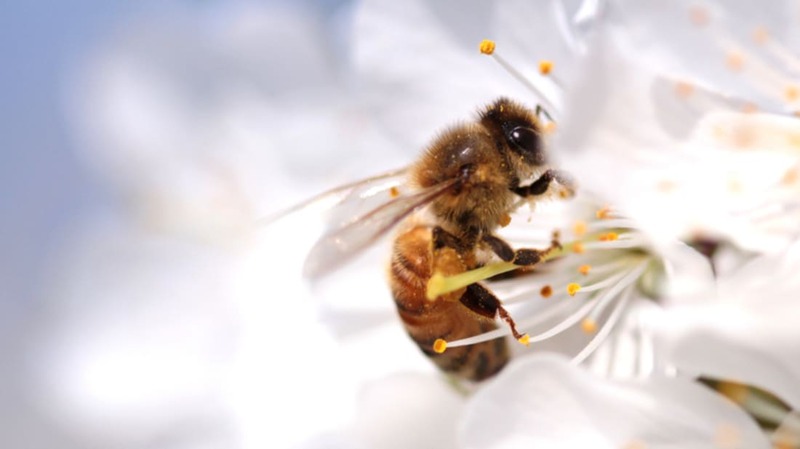 The honey comes from a tap, making the extraction process easier for humans and bees alike. Feeling committed? There are plenty of ways you can give your time to helping the bees. You can host a bee hive and agree to have a bee block situated in your backyard. The New York Beekeepers Association offers a program where people can offer up available yards or rooftops to keep hives for urban beekeepers. The program matches people up to help encourage more hives in the city. You can also volunteer to join the Back Yard Beekeepers Association. The Connecticut-based group provides information for fledgling beekeepers and organizes educational programs for the community. Sign a petition and let your government know that you care about the declining bee population. This petition is a call for the EPA to suspend use of pesticides and this petition asks your representative to support the Saving America's Pollinators Act. If enough people come together to fight this problem, real change can happen.